Excel Geographical Data Mapping (MapCite) proves and advanced geographical mapping engine menu into Excel 2007 and above. The geocoding add-in for Excel maintains private and proprietary business data within Excel and uses the Bing mapping service to provide advanced and interactive geographical mapping visualizations for Excel and other external reporting requirements. Location information within Excel data is geocoded so that geographical information can be import as additional columns and professional mapping reports generated for decision making. Simplify and enhance business intelligence by visualizing density and heat maps of data such as sales transactions, merchant performance, customer demographics and proximities. Enrich existing data with location specific analytics for targeted and efficient marketing campaigns. 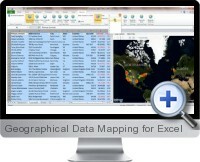 Add geographical maps to existing Excel workbooks and applications with unlimited data geocoding. Pan and zoom the embedded maps to any location or geographical region. Map visualizations automatically update when underlying data sources are updated or changed. Text search is provided to quickly locate and visual data and granular levels. Add labels to pins and markers from specified columns. Select from a range of map types including satellite, road and heat maps. Plot rows of data as markers on a map in your workbook. Markers can be clustered and clicked to view underlying data in balloons. Freehand polygon shapes can be drawn on the map to extract and aggregate data within the region selected. Maps can be shared with others and output for Word, PowerPoint and PDF formats. Compatible with Excel versions for Windows 2007 and higher. Great Add-in for visualizing your Excel data on a map, easy to use too.